When the warmer weather sets in I find myself at the park for HOURS upon HOURS with the kids! And I love it. I love watching my kids build and climb and sorry to rub it in but we're now entering into those years you've all been dreaming about...when your kids can actually entertain themselves at the park! But that leaves me sitting there daydreaming or staring at my phone for long periods of time. Now I've been known to stretch and do exercises in some strange places-the airport and even at a fancy restaurant with my husband on our trip to L.A. and although you may feel a bit strange doing some of these at the park while your little ones explore, this is the golden opportunity to fit some more movement into your life! I've been conscious of the fact that not everyone wants to get too crazy at the playground, so these are some pretty easy movements that won't make you feel too awkward. These are great movements to do in your own backyard during nap time or to up at the cottage (if you're so lucky!). These movements are both safe and super effective for pregnant woman (although please listen to your body if you're having any low back, sacrum or pubic pain) and women who are postpartum (probably anywhere from 2ish months onward). These exercises and stretches are designed to create pelvic stability which is super important in restoring and maintaining core strength and support (including the pelvic floor muscles and abdominals). If you have time to do all these exercises together, that's great, but if you need to fit them into little pockets of time that's great too! This exercise works great standing on a step or something that gives you a little lift. As you inhale allow your standing hip to jut out to the side. As you exhale think of lifting up through the back of your leg, drawing your hip back underneath you. You will probably feel the muscles around your hip (of the standing leg) work pretty hard here! Staying tall and lifted on your standing leg begin to send your bum back as you hinge forward keeping a long, straight spine. You may feel a stretch in the back of your standing leg as you tip forward, which helps release tension in the hamstrings and calves. Wanna make this a bit more challenging? Hold onto your diaper bag, a log or a rock, something to add a little weight and resistance! You may be starting to really feel the muscles around your hip (on the standing leg) working but we've got one more exercise left. Feel your weight on your heel and begin to send your bum back as if you're sitting in a chair, allowing your knee to bend with you. Try to maintain a slight lift of the tailbone, so your bum doesn't tuck under. If you wanna get your heart rate going a little bit here's a great low impact exercise for you. Start with one foot up on a bench, stair, or tree stump (or whatever else you can find lying around) and on an exhale, lift the other knee up toward your waist. You may feel your bum and front of leg (quadricep) working on the standing leg. Again, grab something with a little weight to it to add some challenge. Alright here we go! You will definitely feel this exercise working those muscles around the outside of your hips. It's worth buying one of these little bands for sure. You can find them at physiotherapy clinics as well as lots of stores, like Winners. Place a band under both feet, cross in front and hold onto the band creating as much resistance as you'd like. Keep your feet about hip width apart as you begin to walk to one side and then the other. Need a little more instruction for this one, check out this video I made. Okay, well here's one if you can take a minute to lay down. If you're little one's running all over the place, maybe not the time for this one but you can definitely do a standing version. When you can find some time, take the band (or belt, tie or whatever you can find) around the ball of your foot and let your leg reach up to the sky. You can stay here or take your leg across your body creating a nice stretch around the outer hip and back. Time to give those glutes a little release after all that work! Take one foot onto the opposite knee and begin to sit your bum way back like your sitting on a chair. 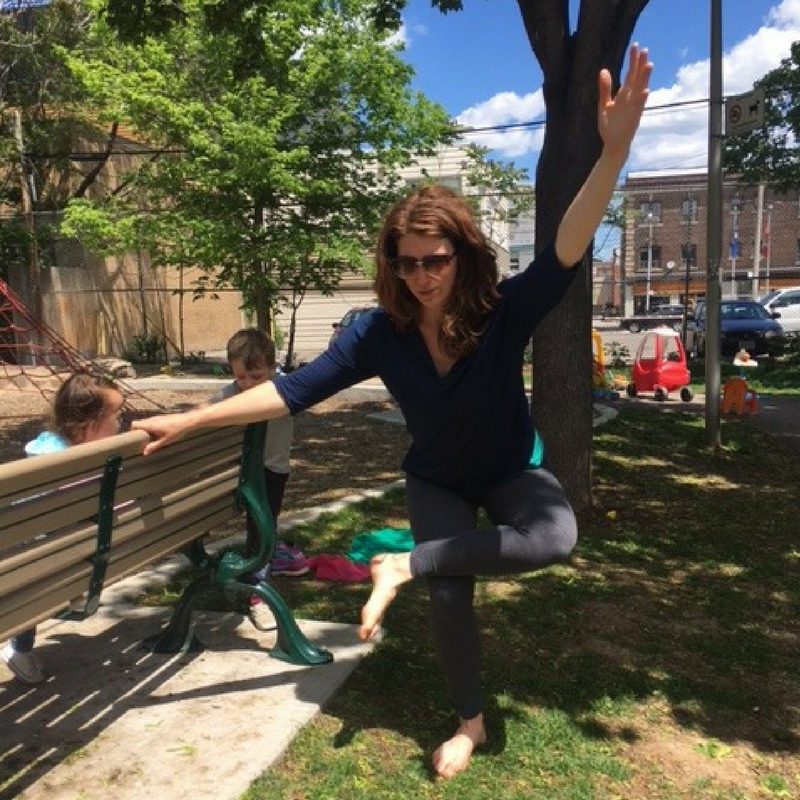 You can hold onto a bench, tree or your stroller if you need a little help with your balance. If not, take both arms to the sky or let your hands rest on your shin. A quad stretch here would also feel really good, sorry no pic. But come up to stand on the same leg and bend the outside leg, taking hold of your ankle. Drawing your heel toward your bum and let your tailbone feel heavy here to really get the stretch into your quad. Let me know how this feels in your body! And share your pics (over on Instagram) of you getting your move on at the local park or up at the cottage! If you wanna enjoy the great outdoors with a group of other awesome mamas, join me this Wednesday at Dufferin Grove for Coffee and Yoga! The perfect way to start off your day!